Some new research which looks at differences in the behavioral characteristics of dogs obtained as puppies from pet stores compared to those obtained from noncommercial breeders has produced some disturbing results. The research appears in theJournal of the American Veterinary Medical Associationand was conducted by Utah veterinarian Frank McMillan from the Best Friends Animal Society and a team of researchers at the University of Pennsylvania in Philadelphia. Veterinarians have long complained that dogs purchased from pet stores are much more likely to suffer from health problems than those obtained from breeders. 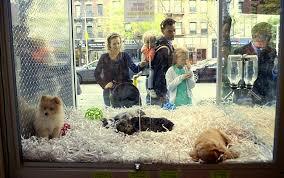 This has led to banning the sale of dogs in pet stores in many venues around North America. The vast majority of dogs sold in pet stores come from what the industry calls "puppy farms" but the rest of the world calls "puppy mills". In most of these establishments dogs are reared much the same way that farmers rear chickens to be used for food. The animals are often kept in wire cages and they are not removed even to allow them to eliminate. The dogs get virtually no socialization or personal attention from human beings. Anyone who knows anything about the psychological development of dogs would doubtless predict that this is a bad situation and is apt to produce many behavioral problems in the dog's later life. However, although various studies have looked at health differences between pet store and breeder purchased puppies, there is little information about psychological differences between dogs obtained from these two sources. This recent study looked at 413 dogs obtained from pet stores and contrasted them to 5657 dogs obtained from breeders. The idea was to compare dogs that are purebred and all obtained as puppies at approximately the same age. Behavioral measures were obtained using an online version of the Canine Behavioral Assessment and Research Questionnaire (C-BARQ). This is a 100 item questionnaire which was developed by James Serpell, who is one of the researchers on this team. It is one of the best known, and most carefully validated questionnaires that assesses a dog's behavioral characteristics. It is based on the owner's observations of their dogs’ typical responses to a variety of everyday situations during the recent past. It looks at a variety of different aspects of canine behavior, including characteristics like trainability, excitability, various aspects of sociability, fearfulness and a variety of expressions of aggressiveness. The data clearly shows that dogs purchased from pet stores appear to be less psychologically sound overall. On 12 out of the 14 behavioral subscales the pet store dogs showed significantly less desirable behaviors, and in no category did the pet store dogs have a better score. The strongest and most disturbing effects were observed in relation to aggressive behavior. For example the owners of sexually intact pet store dogs were three times more likely to report that their dogs had acted aggressively toward them, than were sexually intact dogs acquired from breeders. In addition the pet store dogs were nearly twice as likely to be reported as showing aggression toward unfamiliar dogs. Pet store dogs were also more likely to have issues associated with stranger directed aggression and aggression to other dogs in the household. More than that, fearfulness is a greater problem in the pet store animals. They show significantly higher rates of fearfulness toward other dogs, unfamiliar situations, and strange events. They also show significantly more separation related problems and higher touch sensitivity. In addition the pet store dogs were somewhat more excitable, energetic, and attention seeking. Moreover these dogs showed a range of miscellaneous behavior problems at significantly higher levels than the dogs obtained from breeders. These problems included escaping from the home, sexual mounting of people and objects, and most forms of house-soiling. ​ There was some indication that the pet store dogs tended to be less trainable, although further analysis showed that this was mostly true for dogs that did not participate in working or recreational activities rather than the whole population of pet store dogs. The guess is that the problems that pet store dogs have to do with the fact that the majority of them come from puppy mills and therefore simply do not have adequate early socialization. These puppies have inadequate human contact, little chance to interact with their environment, and suffer from inappropriate housing which does not allow them to learn house cleanliness on their own. Researchers, especially those who deal with psychological issues, are usually rather cautious as to their recommendations and conclusions. Behaviors are so fluid and variable that psychologists seldom want to come out with a "thou shalt" or "thou shalt not" kind of pronouncement based upon their data. In this particular study however, the researchers presented a hard and uncompromising conclusion which was "until the causes of the unfavorable differences detected in this group of dogs can be specifically identified and remedied, we cannot recommend that puppies be obtained from pet stores." A puppy appears to be well-behaved, confident and acts like Mr. Sociable one month, yet by the next, behavior problems are rife, temperament problems appear seemingly out of nowhere and basic manners and off-leash reliability crash and burn. How could anyone ever love their dog too much? Our pets are the only creatures on earth that seemingly give us unconditional love. So, how could we do anything but return their love with more love and affection?